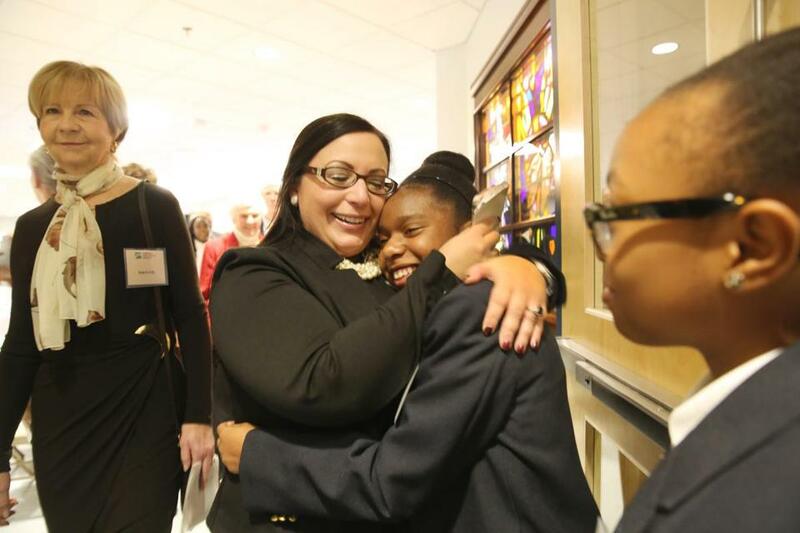 Principal Lisa Warshafsky hugged student Orianeh Byron-Gabelus on Wednesday at the rededication of the Lower Mills campus of St. John Paul II Catholic Academy. With a blessing from Cardinal Sean P. O’Malley, the Lower Mills campus of St. John Paul II Catholic Academy was rededicated Wednesday to mark the completion of a $10 million renovation project for the 100-year-old elementary school. The cost of the renovations was covered by the private nonprofit organization Campaign for Catholic Schools, which was initiated by O’Malley in 2007. In a statement, O’Malley said he was happy to continue to see improvements made at local schools. The upgrades have made the campus fully accessible to people with disabilities, the archdiocese said. The Lower Mills campus is one of four St. John Paul II Catholic Academy locations in Dorchester and Mattapan. New music, art, and science labs have be added to benefit the 326 students who attend the school on Dorchester Avenue. In the statement, Mayor Martin J. Walsh commended the fund-raising group for making additions to the school possible. “The St. John Paul II Academy is an important part of our city’s fabric,” Walsh said. Families and individuals who donated to the Campaign for Catholic Schools for the Lower Mills campus renovations were able to name the new classrooms after the person of their choosing, the archdiocese said. Many of the donors named classrooms after their parents. Since the Campaign for Catholic Schools began, $78 million has been raised and put toward improving teacher salaries and education opportunities at Catholic schools in Greater Boston. According to the archdiocese, the four campuses of the Saint John Paul II Catholic Academy total 1,252 students, making it the largest elementary school in Boston and the largest Catholic elementary school in the Northeast. Sarah Roberts can be reached at sarah.roberts@globe.com. Follow her on Twitter @heysarahroberts.